Click here for pictures of past rides. We meet at the trail head parking lot. 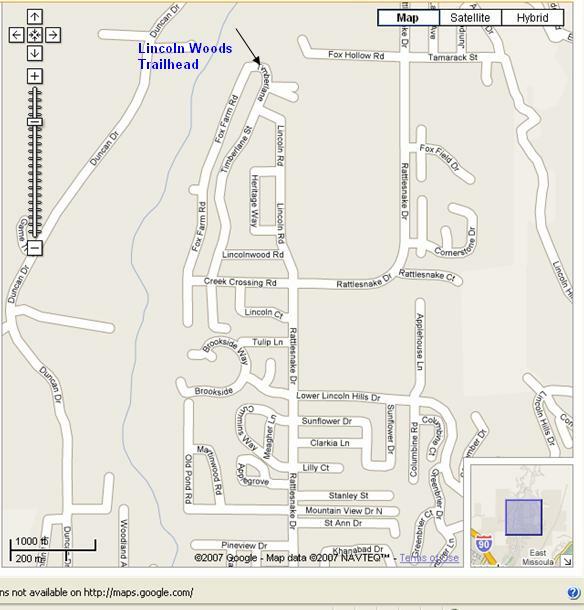 Turn left off of Rattlesnake Dr. onto Sawmill Gulch Rd. 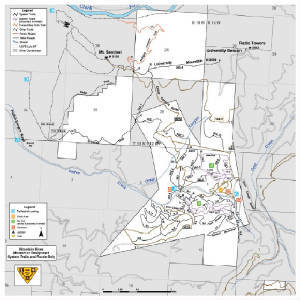 With the major trailhead only 4.5 miles north of Missoula, the 61,000 acres of glaciated topography in the Rattlesnake Wilderness and National Recreation Area (RWNRA) form Montana's premier urban wilderness, blending the best of both wilderness and civilization. 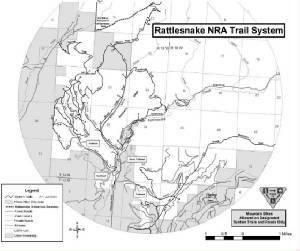 The U-shaped Rattlesnake basin is fed by more than fifty small creeks that begin as seeps from springs and melting snowbanks in the upper Wilderness portion of the NRA. Resting in the more than thirty high mountain lakes, crystal clear water then plunges down waterfalls to hanging valleys separated by sheer headwalls and carpets of sub-alpine fir, lodgepole pine, and spruce sloping down to open Douglas fir and ponderosa pine parklands. The non-wilderness (yet still wild) part of the NRA , devoted to wildlife and recreations, is guarded by the southern flanks of Stuart Peak. From this prominent point north a knife edge ridge climbs still higher to the sentinel of the Rattlesnake-remote 8620-foot McLeod Peak. The east side of the ridge is marked by cliffs, cirques, and rolling basins of intermittent subalpine forest where transplanted mountain goats are thriving in the security of protected wildlands. The gentler western slopes lead down to the open bowl-like basin of upper Grant Creek. Although uncommon, occasional grizzly bears roam here, and every so often the haunting howl of a lone wolf deepens the feeling of wildness. Take the Van Buran Street Exit off I-90 on the east end of Missoula and go 4.5 miles north on Rattlesnake Drive. Turn left onto Sawmill Gulch Road to the main parking area and jumping-off point on the west side of Rattlesnake Creek. The road takes off up the old Rattlesnake FR 99, now closed to all motorized recreational travel. The main trailhead has handicapped access toilets and another one 1.5 miles up the main corridor. 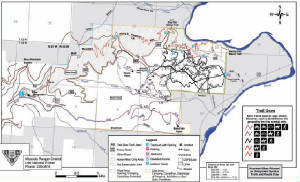 The area is closed to dogs in the winter to protect elk on their winter range and during calving season. In the summer dogs are allowed only on leashes before the 1.7 mile mark. Pattee Canyon Road takes off from Higgins Ave, just as Higgins bends to the right and turns into SW Higgins Ave on the south side of town. 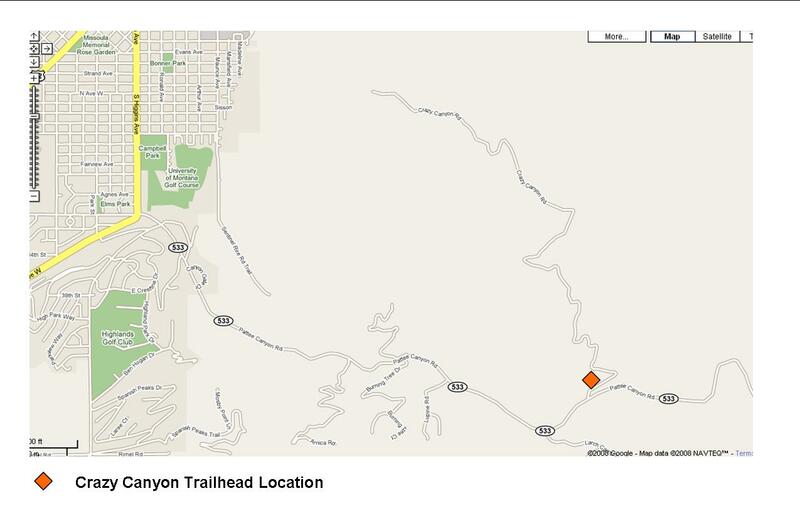 Pattee Canyon Road is paved for 4.5 miles to the top. Crazy Canyon is located ~3.5 miles up this road on the left hand side. Go on Hwy 93 (Brooks) south, turn right on Blue Mountain Road, go ~1/2 of a mile and road will bend left. Turn left into trailhead. To get here, drive up Rattlesnake Drive. Turn right onto Lincoln Hills road. Drive to the top until the pavement turns to dirt.